Here it is! 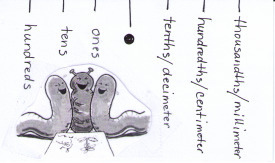 The one, the only, the amazing Metric Worm!There are lots ways to use my versatile friend, the Metric Worm. This little buddy really helps to take the panic out of visualizing fraction/decimal equivalency. I've coached many a tearful student with this tool. Today I will demonstrate just one of the numerous ways to use the Metric Worm. Instead of high-tailing it to the teacher store and dropping close to $10.00 on the latest expensive educational gizmo, just get yourself a index card and a marker. I jazzed mine up with a picture. No need for that, however, as a bribe, I have been known to allow a student to jazz up their Metric Worms AFTER they have proven that they know how to use it! Alls fair in love and teaching. Decide upon a very long number. I choose 92,743. Write it out. Now, rewrite your number as a whole number and a fraction. I changed my number into 927 43/100. How in the world can we rewrite this number as a decimal? Let's look at the number. The whole number is 927, right? And the fraction is 34/100. Okay now, let's look at the worm. We know that a decimal separates a whole number from the fractional portion of the number, yes? So, we simply rewrite that big, scary fraction as a decimal by laying the worm on the paper and initially making the decision where the decimal should go. Then we write the whole number to the left of the fat decimal. I wrote my 9 about the hundreds place, the 2 above the tens place, and the 7 above the ones place. Now, the terrifying metric part. I simply put the 4 above the tenths place (decimeters) and the 3 above the hundredths place (centimeters). Easy. Let's do it again. How about changing 92 743/1000 into a decimal? Here's where the tears begin to flow. Something about working with the 1000ths place always seems to unleash the waterworks. Take a breath. There are no worries with the worm, remember? Just lay the worm on the paper. Where does the decimal go? Where does the whole number go? How about that nasty old metric number? Hey! Look at you! You've got it, smarty pants! This Metric Worm illustrates whole numbers into the hundreds place and metrics into the thousandths place (millimeters). Once the kiddos understand this wee little worm why not branch out into the millions and millionths? The gazillions and gazillionths? Stretch that wiggler. This is the kind of mental-gymnastical thinking that creates enthusiam out of a concept that was once confusing. Kids love numbers. They really do. Once they understand, they love to think big or metric small. No limits! Have fun with this. Give credit where credit where credit is due, right? I stole this idea from a good teacher my daughter Taylor once had. Though I cannot remember her name right now, her brilliance lives on.